Mike King umpired the eight round 2500 point Natcon over the weekend. It was incredibly hard fought with no-one getting a break on the field. 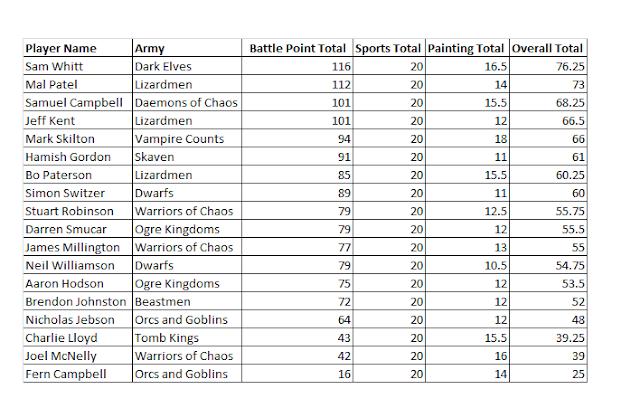 The Fields of Blood Fantasy Rankings have been updated to reflect these results. 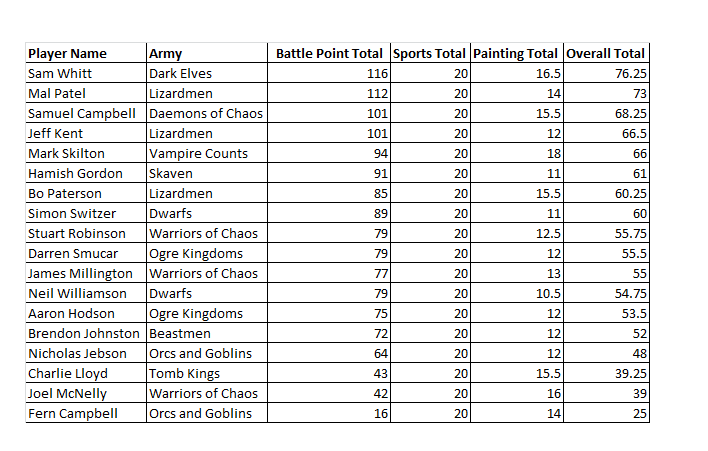 The key mover was National Champ Sam Whitt who jumped four spots to a career high 5th and picked up the Dark Elf icon for his trouble. Glad Mark was able to make use of my VC and get a decent placing! You failed to mention the winner of the butcher award... I heard the Dwarfs took it by a few thousand points. I reckon people must have filled their sheets in wrong for you to be so ar ahead...;) just kidding man, well done in the butcher award. It's a pity you had the brain fart against mal last round, you deserved to be higher up the table. It is a tough matchup for you though. The thing about Mine and Mals game was that who ever won was probably going to be 2nd or 3rd and who ever lost was going to be around 8th-10th... And the way I deployed as you saw was fooking shite. Still really happy with effectively 8th though, got 9th due to my painting. But I'll grudge Mal at Runefang and beat him that time around... hopefully. Thanks to Mike for a well run tournament and to all of my opponents for 8 enjoyable games. I had a great time and look forward to seeing people again at Runefang.